[S392] Website findagrave.com (http://www.findagrave.com/) "# 97013288." [S89] Family Search, Vital records of Framingham, Massachusetts, to the year 1850 Baldwin, Thomas W.
[S205] Newspaper, The Sydney Morning Herald, 6 September 1910. MAJOR ADRIAN RUSSELL FORTESCUE HUBBARD, M.D. Representative of a distinguished English family, accomplished in medical lore and with a long practical experience in his profession, Dr. Adrian Hubbard, of the City of Quebec, has established himself firmly and reputably as a practitioner here. Although favoured beyond most populous centers with a high grade of professional representation, Quebec is nevertheless fortunate in the possession of such outstanding citizens as he. His record before coming to Canada to make his home was notable in its achievements and comprehensive in its scope, while his work in Quebec has brought him to the favourable attention of the populace and been the source of a large number of satisfied patients, while his brother practitioners hold him in the highest esteem and admiring regard. He has a multitude of friends and is a valuable citizen to this Province and to the Dominion. Adrian Russell Fortescue Hubbard was born at Ramsgate, Isle of Thanet, Kent County, England, February 10, 1878, a son of William Alexander Hubbard, who was town clerk of Ramsgate for more than thirty years, and Catharine Eliza Gordon (St. Aubyn) Hubbard, she being a daughter of Major St. Aubyn and a grand-daughter of Sir John St. Aubyn of Michaels Mount. He acquired his early education at St. George's College, Ramsgate, and finished his professional studies at Charing Cross Hospital Medical College. In 1902 he became a member of the Royal College of Surgeons and a licentiate of the Royal College of Physicians, later passed the Primary Fellowship examination in the Royal College of Surgeons. In 1902 he was also house surgeon of the Charing Cross Hospital and in 1903 house physician of the same institution. During his period at Charing Cross he was a member and secretary of the Hospital football team that played successfully up to the semi-finals in the Hospital Rugby Football cup matches. His work at this hospital was followed by his service as medical officer of the St. John's Wood Free Dispensary, in London, where he remained until the latter part of 1904, when he went to Manchester as assistant to Dr. G.A. Pinder. Here he continued until 1910 and in the following year came to Canada and located in Quebec. Here he established an independent practice and quite soon was appointed assistant surgeon at the Jeffery Hale Hospital and then made surgeon of that institution. In 1912 he volunteered in the Canadian Medical Corps and was commissioned a captain in 1913. In the following year he became a member of the Medical Staff of the Military Hospital of Quebec and in 1917 was promoted to major and placed in charge of the Military Hospital here. In November, 1917, he was a member of the first relief train's complement from the Royal Medical Corps to rush to Halifax, Nova Scotia, where he was in charge of the victims of the explosion who were cared for by the Emergency Hospital, organized under the auspices of the Young Men's Christian Association. In 1918 he became medical director of the Soldier Civil Reestablishment district of Quebec, in which capacity he served for two years. He is a Fellow of the American College of Surgeons, with which he has been affiliated since 1920. He is past secretary of St. John Ambulance Association and a member of the Quebec Garrison Club; Kiwanis Club, of which he has been a director; Victoria Curling, Quebec Snowshoe and Colbert Fish and Game clubs. His religion is that of the Church of England. 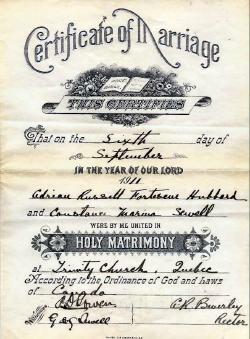 Adrian Russell Fortescue Hubbard married Constance Marina Sewell, daughter of Alexander Sewell, a son of the Rev. Edmond Sewell and grandson of the late Jonathan Sewell, Chief Justice of Quebec. They are the parents of a son: Sewell Fortescue Hubbard. The family residence is maintained at No. 14 Cook Street, Quebec. The Storied Province of Quebec, Vol. III, p. 185. [S232] Ancestry.com, Québec (Anglican) (Québec (Holy Trinity church)), 1911. [S392] Website findagrave.com (http://www.findagrave.com/) "# 59113671." [S350] Nathan G. Park, The ancestry of Rev. Nathan Grier Parke, p. 127.